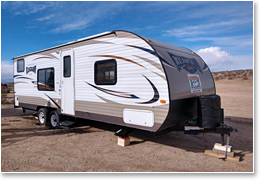 You pull your toys and we will deliver the trailer to your campsite free of charge within a 15-mile radius of Ridgecrest*. Price includes 1 mile of dirt road. There will be an additional charge for outlying areas. *Additional mileage charge over 15 miles is $5.00 per mile, one way and $10.00 per mile on dirt roads. 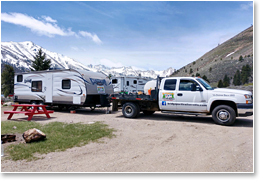 For trailer rentals in the Bridgeport, California area, please visit our sister site, Bridgeport Vacation Trailer Rentals! Call ahead for happy camping. Cancellations must be made within 30 days of reservation. All refundable deposits subject to a $50 service fee. $200 refundable Cleaning & Security deposit due upon arrival. Balance of rent must be paid 30 days prior to arrival date. Rates include delivery and pick up charges, within a 15 mile radius. 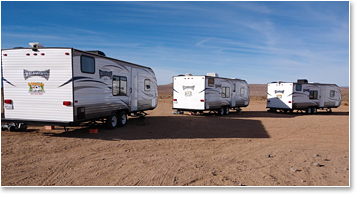 Rates DO NOT include campsite fees. We also accept payment by check. Call us to make your reservation, (866) 224-5881.